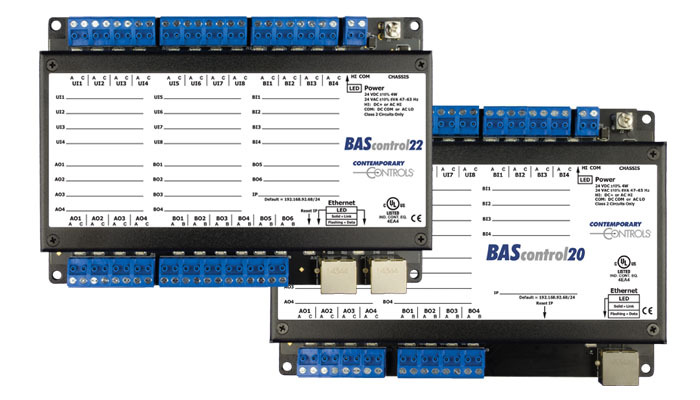 The BAScontrol Open Control Series utilizes BACnet/IP as an open communications protocol, Sedona for open visual control programming, and the BAScontrol Toolset for unrestricted use in program development and archiving. Ideal for unitary control of air-handlers (AHUs), fan coils (FCUs), and rooftop units (RTUs), these controllers are freely-programmable and customizable. There are many BACnet controllers on the market that utilize a closed/restricted programming tool with a proprietary programming language. Our concept of a truly open controller is one that uses BACnet - an open protocol, an open source drag and drop component based programming language - Sedona, as well as an unrestricted programming tool - our free Sedona Application Editor. Our BAScontrol family of products provide all of the features necessary for a truly open controller. 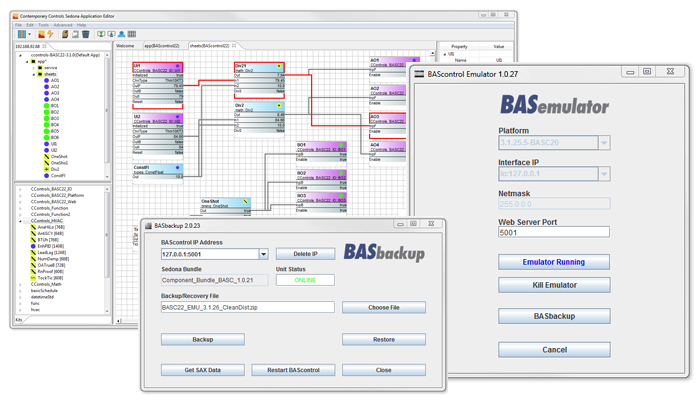 The BAScontrol Toolset includes the Sedona Application Editor (SAE), BASbackup - the BAScontrol Project Utility, and BASemulator – BAScontrol emulation on a PC. Provided free of charge, these tools simplify controller programming and project archiving. All three programs are available as a single install sharing a common Sedona bundle of kits and components. Along with a common web browser, the toolset is all that is needed to commission a BAScontroller. Also compatible with the BASpi. The CvRTU series provides five pre-built Sedona applications for constant volume rooftop units (RTUs) that will execute on a Contemporary Controls’ BAScontrol22 BACnet/IP Sedona controller. 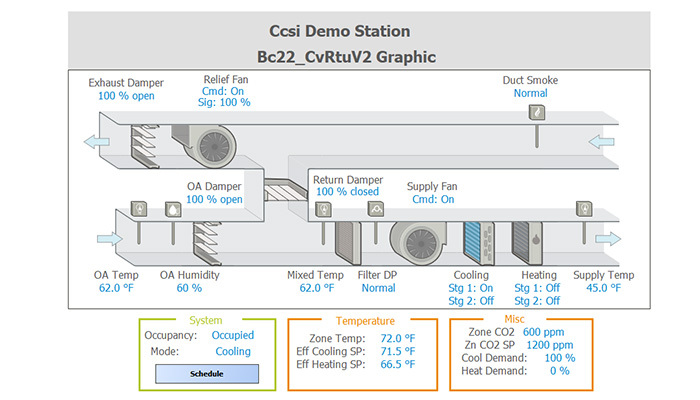 Application versions address multi-staged or analog heating/cooling, fixed or variable speed exhaust fan, dual dry-bulb or enthalpy economizer, wall-setter or network occupied/unoccupied setpoints. These applications come with pre-assigned BACnet points list, sequence of operation, system schematic and suggested device list. Pre-built applications speed up installation time by only requiring configuration during installation. Sequences can be modified using the Sedona Application Editor. 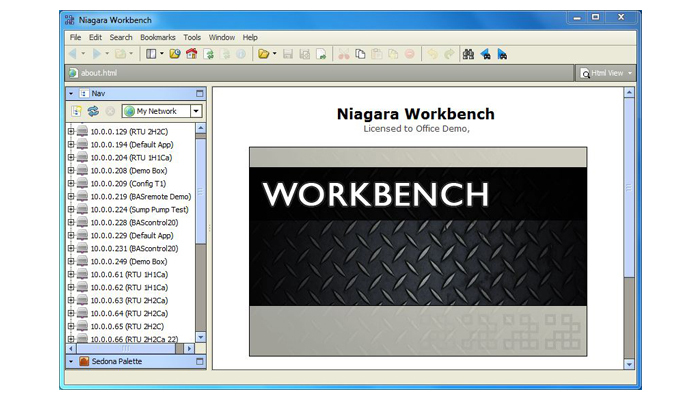 To use Niagara Workbench AX as a Sedona Tool to program your BAScontroller your computer must have a copy of either Workbench 3.7 or 3.8 and must also have a proper installation of Sedona Framework and the latest Component Bundle-both available from Contemporary Controls.